The Taming of the Glue: It's Wednesday! Well my blogging chums, it's Wednesday which can only mean one thing.....WOYWW! To kick things off, here is a piccie of my desk which really isn't very inspiring at all! There's the usual pile of Distress Inks with some Cut 'n Dry, scissors, 3d foam pads, Cosmic Shimmer Mica Powders and a Creative Expressions Teresa Collins Paper Pad (which I am totally in love with!) Other than that, just the usual mess of tools and bits of card from projects I'd finished but not tidied up. The only other thing on the desk is an index card which is what I write all the step by step instructions on when I'm designing a project. This one is top secret so no peeking! All I can say is that it's to do with some brand new products that are being shown on C&C in November!! Over at the Creative Studios blog it's my day for the DT project and I've come up with this one. I've used 2 sets of Sam Poole's Vintage stamps...Inventors and Treasures, as well as an A6 background stamp. I've put a full set of step by steps on the blog so if you're interested, head over to the link on the right that says Sam then go to the DT link at the top. All of the products are available from Sam's on-line shop. In other news, the dig is going really well, just upset that I'm not there now!! There's been a lot of coverage in the National newspapers including a full page in the Times last week. I'll keep you informed about any new finds but if you're interested in it, Amesbury Museum are on Facebook and have lots of photos. It's also where they let you know about future digs and if volunteers are needed. And finally! The fabulous Sue Wilson has just launched a series of video tutorials on her blog (Particraft). She started them yesterday and will have 3 a week. Do go and have a look, she is totally amazing. Thank you for vising and leaving such wonderful comments. 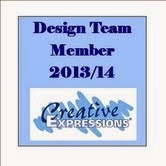 I'll be a bit late visiting this week as I'm off to Creative Expressions Towers today to meet the other DT members. I'm so excited (even if it is a 3 hour drive to get there!!!) Luckily, my wonderful OH has volunteered for driving duty! Many thanks to those who have become blog followers...just another 14 and the draw will take place! Until next time, have a very happy, crafty week! That's a great card! And I looked up your previous posts to check out "the dig"- so interesting that you are able to participate in things like this! I like the Victorian gentleman, he's very Steampunky indeed. All the elements work together so well, the colour, patterns, stamps....I like it! Oh fantastic card, love it so steampunk. I do have a question how many bone folders do you have in that tumbler? Gorgeous DT!? What is a DT? Something tag? Love all that ink! I just took all my ink and labeled them as you did on all sides....I was tired of turning them around to see the color...now, no matter where I put them I can see the color...must be my age. Now you are just teasing!!!! Hope you have a great day today with the CE team, it's great getting together with fellow team mates isn't it. Love your DT project, that quote by Edison is great. The dig sounds so very interesting, be sure to share more when you can. Thanks for stopping by my blog and for the kind comment. you might be surprised as to what can be inspiring! oooh, I love secrets! Can't wait to see it! Love your card, how fabulous! The card is just fabulous. Thanks for stopping by. I've been trying to read you notes but can't make much of it out! The card is lovely, hope you're having/had a great time with your fellow DT's. The dig photos in the earlier posts are really fascinating, are you going to get back there again? Pam your card is great, what a fun set of stamps. What an interesting page, what with your talk of digs, working on cruise ships and going off for the weekend. It all sounds very exciting! Thanks for commenting on my blog. Nice to know that even the professionals amongst find themselves keeping stuff for special occasions! I'm late Pam, so hope the CE DT meet was as much fun as it promised to be! I'm on the ipad so can't enlarge enough to try to decipher your notes..but If I could..well. You know how nosey I am! Lovely card design, you sound so busy! Love the name of your blog - too cute!! Also love you style my friend!!! Love your DT, I really like the old style look. Hope you find plenty on your dig, if you can get back there. Fascinating post, Pam - my hubby is really interested in archaeology and has been involved two years running in a local dig here in S. Devon - an important Roman find. Love your steampunk card, and what a great sentiment - we should all think like Edison! Thanks for your lovely comment - I am thrilled with my new ARThaven! One day I shall get it properly organised... I shall come up with a suitable alternative for the doorplates, I am sure, and perhaps more experimentation is needed. I'm looking forward to painting them! I love the title of your blog! ROFL! I love all the perfect little details in your cool steampunk card. Congratulations on the dig and all the coverage. Blessings! You certainly keep busy, don't you? Your desk and work looks great. Well done. I'm a bit behind and still visiting desks. Hubby is doing well but 1 more week of soft food. Checkup tomorrow morning. Anyway, I love your projects!! Happy belated WOYWW and thanks for visiting! What a fabulous card! Thanks for visiting! Love the vintage card and enjoy the meet up. Oooh I love that steampunk feel card! Have fun with your DT friends. i like your cards ! Amira Basmati Rice is rice grain.. It's longer and has﻿ more flavour and fragrance than normal rice..